The National September 11th Memorial remembers and honors the nearly three thousand people who died in the horrific attacks of February 26, 1993, and September 11, 2001. Visitors to the National September 11th Memorial are greeted by sheets of water cascading 30 feet down into twin reflecting pools set in the footprints of the Twin Towers. These manmade waterfalls have a scale that is unmatched. The Memorial consists of two massive pools set within the footprints of the Twin Towers with the largest manmade waterfalls in the country cascading down their sides. Concrete contractor Navillus Concrete selected Doka's framed formwork Frami to form the 720 lineal feet of walls on both fountains, each fountain spanning 200 feet by 200 feet. Because of the existing structural steel and the decking that was already in place, forming had to be handset for this project. 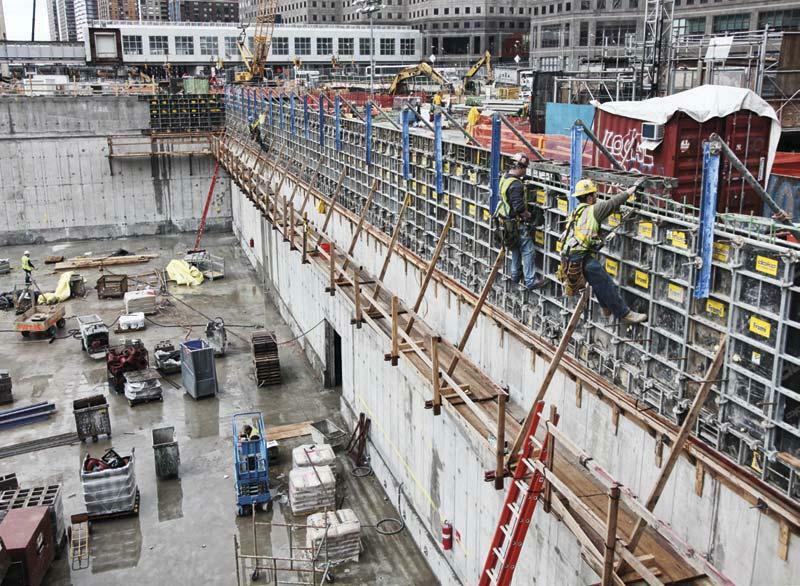 In addition to the memorial fountains, Doka provided more than 50,000 square feet of Frami and Framax wall formwork to construct the 9/11 museum exhibition. The museum features three levels descending below ground that provide access to the original foundation of the twin towers. Reaching heights of more than 63 feet, Navillus used Doka's framed formwork Frami with custom aluminum walings on the un-exposed side of the new concrete walls. The memorial and museum opened to the public September 11, 2011. Remembrance and honor to those died in 26 Februry 1993 and 11 September 2001. More than 50,000 square feed of Frami and Framax wall formwork supported the construction. Thank you for your interest - National September 11th Memorial. Thank you very much for your interest - National September 11th Memorial.